(TNS)—Search on the web for “best time to book airfare” and you’ll find many conflicting answers, all of them completely wrong—and not only are they wrong, but they do a disservice to consumers who fall for this “voodoo” airfare economics. One site gives a “guide” of 47 days before travel, although it admits that there is “quite a variance” depending on route and destination. Keep in mind that the booking site in question doesn’t offer or track Delta or Southwest, which together control about 35 percent of the domestic market, so its predictions have to be taken in that context. Another site’s founder has infamously insisted that the best time is Tuesday at 3 p.m., (that site also doesn’t track Southwest or Delta). Expedia and the Airlines Reporting Company claimed earlier this year that the best day is not Tuesday but—wait for it—Sunday. But wait: Skyscanner says it’s exactly seven weeks in advance of travel. So who can you believe? Answer: none of the above. The best idea: sign up for “airfare alerts” by email. Search the term on the web and you’ll find many options from reputable companies that send out email alerts. Before you sign up, however, make sure that they at least include Delta Air Lines (that excludes such popular apps and sites as Hipmunk and Hopper along, with several others). If they also include Southwest, all the better, but few do. These alerts all work a bit differently. Some only allow you to track specific dates, which is cool, except what if leaving a day or two earlier would have saved you hundreds? Some allow you to specify “to” and “from” specific airports, because a fare from Baltimore Washington International (BWI) might not be as ideal as one from closer-in Washington National DCA. Most alert systems treat “nearby” airports as equal, but tell that to someone who doesn’t want to trek out to Baltimore or Dulles when National is just a Metro ride away. Another big annoyance is that the lowest fares are often on airlines that people hate to fly (because they charge for carry-on bags and seat assignments), so look for a service that allows you to eliminate alerts from airlines you’d never fly even if they were free (Airfarewatchdog.com does allow specific airline choice). 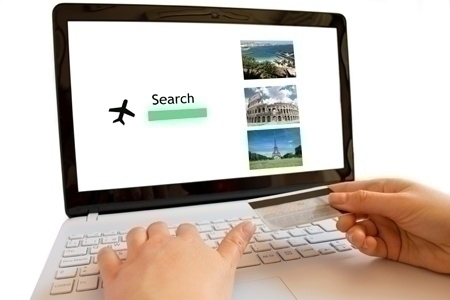 Another reason for signing up for several alerts: all online travel agencies do not show the same prices. I recently saw a fare from New York to South Africa flown on Delta and KLM for $200 less round trip if bought on Priceline versus the exact same flights, dates and airlines if booked on Orbitz, Expedia, Travelocity, or on KLM’s or Delta’s own websites. Some online travel agencies offer negotiated rates that are far less than the airlines themselves sell for. It’s worth searching more than one site. Twitter is another great source for being alerted to short-lived airfare deals. Follow the #airfare hashtag, where over a half-dozen accounts tweet out unadvertised deals. The #flights hashtag is also useful. Follow the accounts you find there. Once you’re signed up or following, you have to act. An airfare from L.A. to Singapore (this is a recent example) might go down, unadvertised, to $398 round-trip including tax on Singapore Airlines, whereas other airlines were charging $800 for the same travel dates but on less desirable connecting flights. But that fare, even if it’s good over several months of travel, might appear for just three or four hours and then it goes back up to $800. Now that airlines allow you to pay for a fare and cancel within 24 hours without paying a fee, the strategy is to book it, hold it, and then get your friends and family on board and sort out hotels.